Irati Etxarri is a versatile 1.86m Spanish international forward born in 1998 who has experience both in Spanish Liga Femenina and in National Team, being Silver Medalist in the U18 European Championship 2016 and Bronze Medal in the U16 European Championship 2014. Irati Etxarri is a very athletic player, with a 2 meter wingspan, who is among the best European players in the 1998 generation. Irati Etxarri´s career began at Mendillorri, from where she moved to CB Burlada, becoming Navarra U14 Champion in the 2011/12 season and being named in the Spanish Championship First Team after finishing with her team in 6th position. In the 2012 summer, Irati Etxarri played the U14 BAM Tournament with the Spanish National Team. In the 2012/13 season and still as a U15 player, Irati Etxarri was U18 Navarra Champion and played the Spanish Championship in Zaragoza. At senior level, she also played Spanish 3rd division with Liceo Monjardín. Irati Etxarri stayed in Cantolagua during the 2013/14 season. In the 2014 summer, Irati Etxarri won the Bronze Medal in the U16 European Championship and she averaged 6.9 points and 5.2 rebounds in 21 minutes per game. In the 2014/15 season, still as an U17 player, Irati Etxarri won the U18 Navarra Championship and played the Spanish Championship in Guadalajara. At senior level, Irati was League Champion, promoting her team to Spanish third division. Irati stayed at Cantolagua during the 2015/16 season and she finished the senior championship in 3rd position. Inmediately after, in the 2016 summer, Irati Etxarri won the Silver Medal in the U18 European Championship, averaging excellent 7.7 points and 3.3 rebounds in just 18 minutes per game. Irati Etxarri signed with Araski for the 2016/17 season and in her debut in Spanish Liga Femenina she averaged 4.4 points and 2.9 rebounds in 18 minutes per game, reaching the League Semifinals. 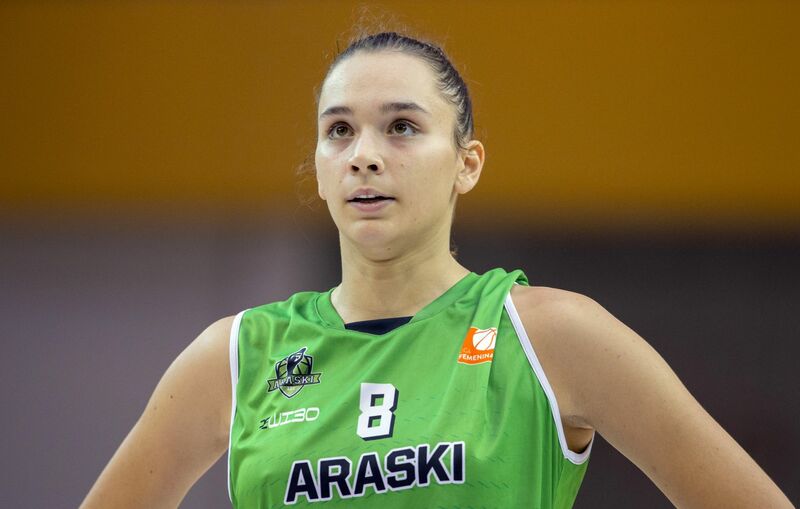 With Araski, Irati Etxarri also reached the Queen´s Cup Semifinals, having a breakout game with 17 points and 4 rebounds in 25 minutes in the Semifinal loss against Girona (71-78). Irati Etxarri extended her contract with Araski for the 2017/18 season and she averaged 4.9 points and 3 rebounds in 16 minutes per game.